I’ve been thinking a lot about the issue of frugality vs. sustainability, which is a tricky subject. Yes, we want to be buying locally made and grown products, but not at the expense of our financial stability. So which should we choose? Luckily, things are never so black-and-white. I went to a reading for my father’s recently published novel a few weeks ago. It was held in a small, locally owned book store. In the introduction, the owner said that, “Your decisions of where you shop truly determine your community.” I was struck by this notion and spoke with her afterwards to make sure I got the wording right. At this time more than any other in our lifetimes, our weak dollars are powerfully strong. We can choose to save a few bucks here and there buying from national chains that do not support our local communities, which has the potential to destroy our communities. Or, we can decide to support the businesses that we want to keep in our neighborhoods. Does this mean I’m spending $2.50 a pound to buy locally grown organic apples? No. I choose to work part-time so that I can be the parent I want to be, and have time in my life to do the things that give me pleasure and satisfaction. Life is about balance and moderation, and I try to live as frugally as possible without being cheap in my decision making. It’s a fine line and I definitely straddle both sides. I’m very deliberate in my spending, which makes all the difference. Sometimes I make the sustainable choice, but other times I make the purely frugal choice. I would like to be making 100% local and sustainable choices, but that would mean working full time. Which goes against how I want to be spending my energy at this stage of my life. There are some areas where I’m willing to spend more to support my values. I pay extra for green energy, choose a locally owned bookstore over Amazon.com and let my kids spend their money at our favorite neighborhood art supply store. Do I buy our groceries at New Seasons Market, our locally-owned-mostly-organic-and-local supermarket? Sadly no, as this would at least double our food expenditures. There are very few absolutes in life. I make neither completely frugal nor completely sustainable choices in my life. Every purchase I make, (or don’t make) is a opportunity to create the world I want for my family. Spending too much means driving 20 miles to work and back, and being away from my family. Getting the cheapest deal at any cost means supporting a disposable consumer culture that perpetuates the type of consumerism that I try to not support. 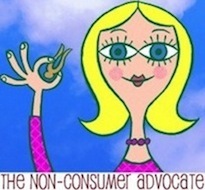 Besides joining The Compact, (buy nothing new movement) what’s a Non-Consumer to do? Beyond suggesting that each and every life purchase should be individually scrutinized, I don’t really have an answer on this issue. But I am curious to read your thoughts on the matter. Please share your take on frugality vs. sustainability in the comments section below. I sold a push reel lawn mower through Craigslist, as well as a set of educational flash cards, a signed Edward Gorey book and another Starbucks travel mug on eBay. (I thrifted three brand-new travel mugs last month.) I also sold a couple of vintage houseware items to a local shop. The lawnmower took months to sell, but I wasn’t worried, as few Oregonians are in the market for a lawn mower in the middle of winter. My husband brought home a large bag of nice clean bubble wrap from work, which makes me very happy as it otherwise goes into the garbage. I can’t take it all as I only mail out 2-5 sales per week, but I can play a small role to keep plastics out of the landfill. I turned off the furnace and opened the windows as Portland is enjoying a rare warm and sunny weekend. I hung some laundry on the clothesline and spent a hour or so relaxing on the front porch with a library copy of the book Maid. So well written! I researched discounts for a dinner I’m being treated to by my mother, (10% AARP discount!) I packed leftovers for work lunches, I listed a couple of thrifted cast iron skillets on Facebook Marketplace and Craigslist, I returned library materials on time and I washed my sheets and immediately put them back on the bed as we don’t own many sets of sheets. Much cheaper this way. I sold a pair on Danskos through Facebook Marketplace as well as a Starbucks travel mug through eBay. 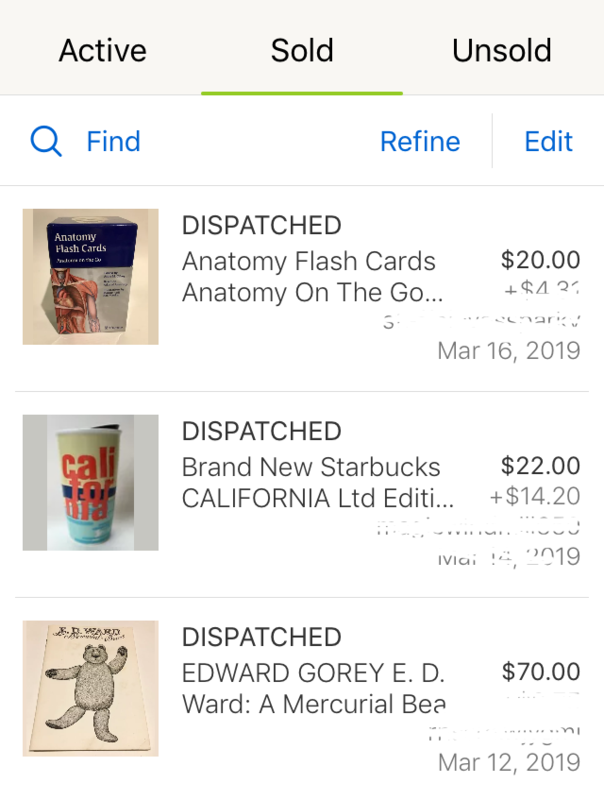 I rewrote a couple of Facebook Marketplace listings and then cross posted them on Craigslist, and body surfed coasted on the momentum to list a few new things on eBay. I was almost out of checks, so I stopped by my credit union to have them print out a dozen free “temporary checks.” Because I rarely write checks in the internet age, these ones will likely set me for the entirety of 2019. This may seem hardly worth the effort, but the cumulative effect of a thousand frugal decisions keeps me financially on track. Whatever it is that’s the opposite of “death by a thousand cuts,” this is it. Maybe “success by a thousand frugal hacks?” Not as catchy, yet ever so practical. 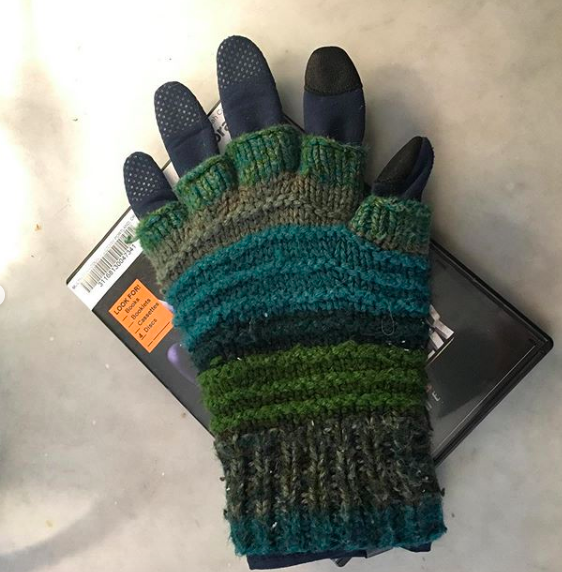 I brought home and laundered a nicely hand-knit glove that I found in the library parking lot. (It looked like it had been there for a couple of days.) The sad thing was sodden and filthy, so I doubted the library could put it into their lost and found box. Now it’s nice and clean, so I’ll drop it off the next time I stop by the library. Hopefully it’ll make its way to its owner. If not, at least I gave it one last chance. I stopped by my husband’s workplace to pick up free boxes for a friend who’s moving, I’m repeatedly enjoying scratch cooked black beans with roasted sweet potato cubes for meals, as they’re damned delicious and ridiculously frugal, I went on a “Goodwill Outlet date” with my friend Lise, where I picked up two pairs of pants, (“trousers” for you Brits) as well as a nest of vintage curtain rings. I’ve listed the curtain rings on eBay, and have have already worn both pairs of pants, which miraculously both fit perfectly. I didn’t buy a Lear Jet or pay $500,000 to bribe my kids’ entrance into college. I sold a college diploma case and the inner canister to a Dyson vacuum cleaner on eBay. Both items were thrifted and I kept to the general rule of thumb to not list on eBay unless I can make at least $20. I had to shell out money for packing tape, but I stood in the store aisle for a good five minutes figuring out which tape was the cheapest per linear foot. I ended up buying two three-packs, as there was a buy-one-get-one-half-off deal on tape, which hammered home the truth that broke people pay more for stuff. How? I paid a larger amount to get a better price per roll by buying a larger amount, but had I been financially insecure I would have picked the single roll which was more expensive per linear foot. I go through enough tape that I’ll actually use six rolls of tape in a reasonable time, and am happy that I’m at a point in my life where I can make these spending choices. But I sure as hell remember paying more for stuff simply because I didn’t have enough money to take advantage of bulk deals. I took my mother out for a Day of Adventures as her Christmas present. 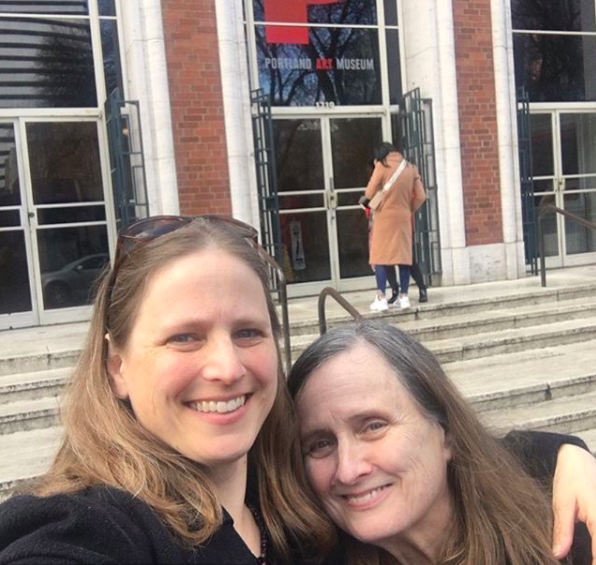 I won’t go into too much detail as I’ll write it up as a separate blog post, but it featured admission into the Portland Art Museum courtesy of a free library cultural pass. This alone would normally have set us back $37 for admission. She doesn’t need more stuff, and the day’s experiences astronomically outweighs a pretty scarf or sweater. I got called off from another 12-hour hospital shift, but am sending out invoices for freelance writing and will easily be able to pay my bills. Having more than one iron in the fire or a ‘patchwork income” gives breathing room to my family’s budget. I picked up organic Orowheat bread at the Dollar Tree, I wore thrifted clothes, I stopped into Goodwill while running errands and picked up a couple things to sell, I stopped at another Goodwill and bought nothing, I spent a couple days binge watching my library copy of Star Trek: Discovery with the family, I cooked up a big batch of black beans in my Instant Pot so I can create mixed whatever bowls from refrigerator contents, (rice, cheese, peppers, onions, salsa, sour cream, avocado, etc) I mailed out my eBay packages using second hand supplies, (other than the tape, I haven’t figured out a way to source used tape) and I gave a stash of plastic food packaging bags to my father for his dog’s poop. Outer Order, Inner Calm — A Giveaway! It’s a happy day in the publishing world because Gretchen Rubin has written another book! This time, our favorite happiness guru has shifted her focus towards how, (for most people) outer order contributes to inner calm. 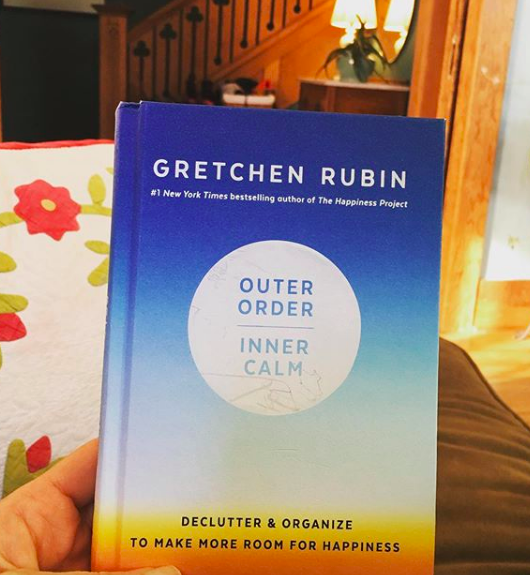 I was lucky enough to receive an advance copy of Outer Order, Inner Calm: Declutter & Organize to Make More Room For Happiness, and am here to say that this book is a delightful gem. Filled with tips that delve deeper than “buy matching baskets,” Rubin explores the big picture, in essence, the why behind an ordered home. Tips that will launch you on your own ordered journey. Just write your name in the comments section below. That’s it. I’ll randomly pick one winner on Thursday, March 7th at 9 P.M. PST. Best of luck, may your entire home be an ordered oasis of calm. Or something similar. Okay, maybe one room. Just one side of one room. The top of the kitchen table? Damn, I needed this book. 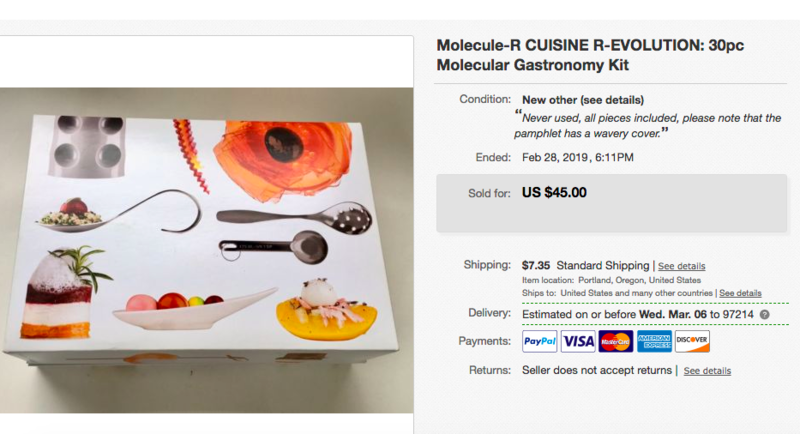 I sold a snowboarding jacket that I’d picked up from the pay-by-the-pound Goodwill bins, as well as a vintage florist’s frog and a bizarre kit that converts food into a frothy substance that frankly looks like saliva. I’d received it as a gift, and it’s now on its merry way to Puerto Rico. I could easily have let it sit on a shelf or donated it to Goodwill, but instead I turned it around for $45 and some random dude across the world gets that one thing that he’s been wanting. It may seem hypocritical for “The Non-Consumer” to sell things, but I’m pairing difficult to find items with people who would otherwise buy new. Things were slow at my labor and delivery unit this week, and I was ordered to stay home for eight hours of a 12 hour shift. My phone rang as I was on my way in, but I didn’t answer it as A) I was driving, and B) I pretty sure they were telling me to stay home. I’d already confirmed that I was to come in, so I continued my commute. They were indeed giving me the opportunity to stay home, but my union has specific rules for these circumstances so I’ll receive my four hours of pay. And you already know that I enjoyed a cup (or two) of their free so-so coffee. Plus, there was enough work for me helping others with their deliveries. My stepfather had a birthday, so we hosted the gang at my house for dinner. I made an Asian style chicken vaguely based on this recipe, as well as rice and broccoli. I baked up a gluten-free box cake that was not only dry but also flavorless, although I balanced it out with a polar vortex of icing. My gift was the meal, plus I deliberately prepared enough to send him home with enough leftovers for another full supper. Nobody needs more stuff, but we do all need delicious food! I picked up the first season of Star Trek: Discovery from the library. (I think it put it on hold summer of 2018, which says a little something about how much Portlanders love both Star Trek and their libraries.) I’d binged it using a free 30-day trial last year, but wanted to watch it again. My daughter hasn’t seen it yet, so we now have three weeks to blow through it together. This newest Star Trek series really does hold up to the hype! I’m hesitant to make such a bold declaration, but I think I like it even more than The Next Generation. 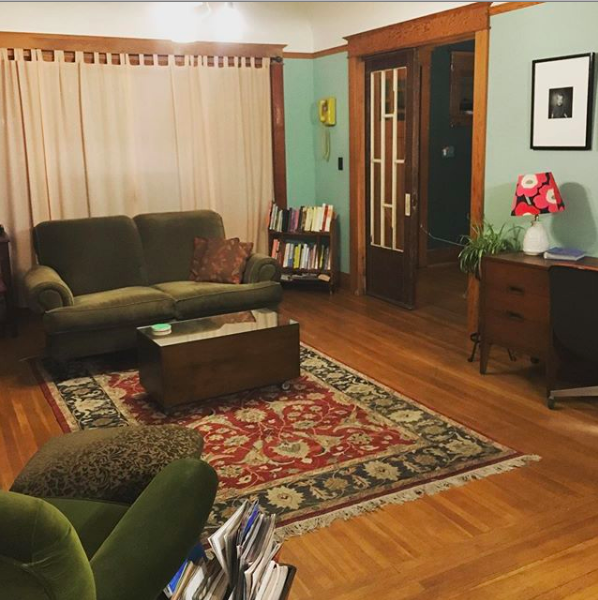 After tremendous complaining, whining and stalking of Facebook Marketplace, I finally found a couch to replace the one my cat destroyed in December. Sure, some might classify it as a love seat, but it’s actually pretty big, and at the low low cost of fifty bucks it’s definitely on budget. I’m just crossing my fingers that neither of my cats mistake it for a litter box. I was able to use a frequent buyer punch card to get a free entree at a local restaurant, which represented five lunches out with my father. Thanks, Dad! My eBay sales have been a bit stagnant over the past week, as all I sold were a pair of napkin rings and some paper Fiestaware napkins. However, I took it as a opportunity to organize the corner of the spare bedroom where I store the eBay supplies, and discovered a half-dozen or so items that somehow hadn’t been listed. Nothing that’ll sell for a tremendous amount, but still worth the effort. Plus, the area is much less of an eyesore, which is a win in my book. I dropped off a book at my local Little Free Library, and later took one which I gifted to a friend, I made dinner from scratch when all I really wanted was to get takeout, (please note that this is a daily struggle) I packed leftovers for work lunches, I bought two Container Store organizing bins at Goodwill, which I then used to organize my kitchen towels/rags, (weirdly excited about this one as they fit perfectly into my narrow pantry and utilize the vertical space in a way that the previous bin didn’t) and I’m getting a free beveled-glass full-length mirror from my friend Lise. I sold a vintage Griswold popover pan on eBay, as well as a pair of Nike sample shoes. (Nike is a local company for us Oregonians, so speciality items hit the thrift shops pretty frequently.) I also renewed a couple of Facebook Marketplace listings, although I doubt that they’ll sell anytime soon as they’re warm weather items. (A bike, a lawn mower and bike rack.) I worked a 12-hour hospital shift and have two more scheduled this week, although one is just a mandatory on-call shift. I was able to transfer a couple thousand dollars into my son’s college account, as the next payment is due at the beginning of April, which is just around the corner. March is a five-paycheck month, as my husband and I get paid on alternate Fridays. I cherish these months. I picked up a few more items to sell on eBay, including some Pyrex ware, a vintage handmade cribbage board, a Furby and a set of educational anatomy flash cards. I’m trying to only sell things I can make at least $20 from. 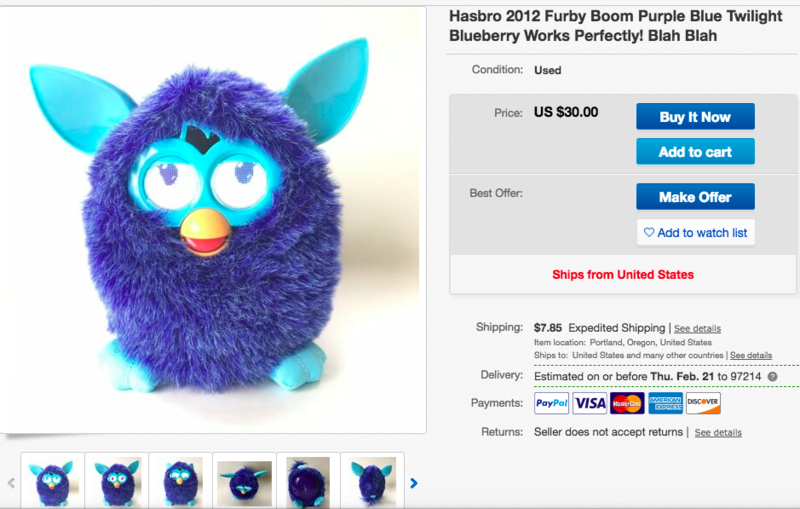 Plus I only want to spend a couple of bucks on anything that I buy for resale. Not smart to spend $30 to make $50 or $2 to make $8. I arranged for a review copy of Gretchen Rubin’s latest book, as well as an extra for a blog giveaway. It’s called Outer Order, Inner Calm, and I’m more than a little excited to dive into it, as Gretchen’s writing is always in depth yet focused and concise. I know the book will provide both inspiration and researched backed data. A lethal combination! I got a free 6-pack of McNuggets as our NBA team scored over 100 points, I brought leftover beef stew to work even though SOMEONE HAD PICKED OUT ALL THE BEEF CHUNKS, I took my son to Dollar Tree to pick up notebooks and coconut oil and didn’t succumb to any impulse purchases, (a Herculean feat!) I’m reading a library copy of Hooked: How to Build Habit-Forming Products by Nir Eyal, I sent out all my eBay items with second-hand packaging materials, I listened to the How to Money podcast while driving and I continue to wear thrifted clothing, sleep on thrifted sheets and sit on thrifted furniture. My 15-year-old son and I just had a very interesting experience volunteering for his annual school auction. As a parent of a two high schoolers, I was surprised at how few people I recognized at a school event for a program my kids have been attending for 13 long years. (I guess I shouldn’t have been surprised, as it is the elementary school parents who make up the majority of involved parents.) We were at the event facility from 5 P.M. until 11 P.M. on Friday, and spent a good three hours of that time working as a busboy. (The public school support organization kept expenses down by not hiring wait staff.) We carried plates, scraped leftover food into the garbage and worked up a sweat in the process. As much as I didn’t know the current cohort of grade school parents, they also didn’t know me. I think a lot of them assumed I was a simple cater-waiter. I would estimate that a quarter of them were very dismissive to my statement of “If you’re done with your plate, I can take it away” which I found to be very telling. They would barely respond to me, and were certainly not helpful in maybe grabbing their neighbor’s empty plate to lend a hand. By comparison, others would reach for plates that were out of my reach and then thank me. I’ve heard that you can tell a lot about a person from how they treat waiters. It got me thinking about how for a supposedly egalitarian society, The United States very much has societal levels that that are both glaring and subtle. The 99% vs. 1% has received a lot of attention over the past few years, but that 99% is split into endless categories. Race, education level, attractiveness and nationality all affect how we are perceived in this world. And as a white, generally attractive and well educated woman, it’s not part of my daily thinking. Don’t get me wrong, as I wasn’t upset or angry with the experience. I just considered it to be an interesting point to ponder. As an experienced labor and delivery nurse, I am used to being a source of important information, with people hanging on my every word. And as a successful blogger, I am used to people respecting and admiring what I do. (As the parent to two teenage boys, I am used to being mocked and ignored, but I take that with a grain of salt.) I’m not used to people barely acknowledging my presence. How is this related to non-consumerism? No I’m not wealthy, but I was raised in a middle class home where I always knew I would go to college. I live in a safe and community oriented neighborhood where I can walk to two excellent grocery stores, and I can trust that my stable neighbors can be trusted. Yes, we had to buy a disgusting fixer-upper to make this happen, but we did. And I never give a second thought to the reliability of my transportation. And I usually take that for granted. My non-consumerism relies heavily on the community I live in. If I were in more of a low income area, my food shopping options would likely be limited, and our safety would not be a given. I have opportunities that many other Americans do not. I’ve run three food stamp challenges over the past few years, and there are always a few readers who respond with judgment about how real food stamp recipients should be living their lives. They choose to ignore how a person’s inherent privilege gives them advantages that we’re often not even aware of. So thank you, fellow parents for reminding me to appreciate the privilege that makes my daily life both easy and safe. My friend Lise texted asking if I had afternoon plans, as her husband accidentally double booked himself and wasn’t able to use his ticket to see a theatrical production of Sense and Sensibility. Umm . . . yes! 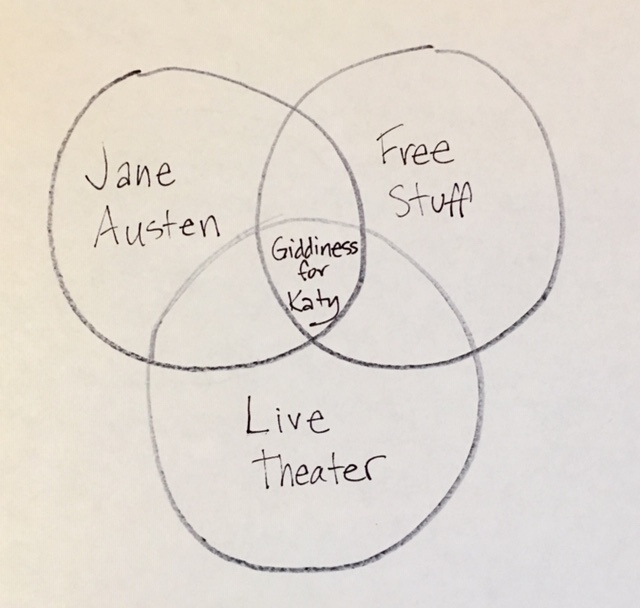 Because Jane Austen + live theater + free are all things I will 103% agree to. Add the three together and giddiness ensues. The play was superb, both hilarious and poignant. And since it was the final production, the actors chewed up the scenery and threw in spontaneous ad libs that added to the hilarity. Perfection. I borrowed a productivity hack from Gretchen Rubin and set the stop watch on my phone for one of her power hours. Essentially to devote a single 60-minute period to completing the annoying tasks that normally don’t float to the top of one’s to-do list. And since I grew up taking dance classes, I add an extra layer to always be thinking two steps ahead, which eliminates the pause points between tasks. No “hmm . . . what should I do next?” which kills any momentum. So while I’m wiping down the front of the splattered kitchen cupboards, I know I’ll clean the cobwebs from the hanging light fixture in the entryway. But I also know that I’ll sweep the basement stairs. As I complete one task I add another step, so I always have two more things to do. Like chess, but for household drudgery. I was able to wipe down the kitchen cupboards, clean the entryway light, sweep the basement stairs, scoop the litter boxes, take out the recycling, put the cover back on the propane grill, wipe down the bathroom, start laundry, sweep the kitchen/dining room, cut forsythia for the dining room, tidy the entryway, (so many shoes!) vacuum the living room/spare bedroom, switch laundry and a couple other things that escape my mind. POWER HOUR! Portland had been forecasted to receive an entire week of snow. Of course, people panic shopped and cleared the grocery store shelves of bread, milk and hilariously, kale. I shop for the pantry, rather than specific meals, which means that I’m pretty much set for general food prep at all times. Granted, I’m walking distance from two grocery stores, but the panic was still an overreaction. Especially since we received an inch or so of snow which has since been melted by Portland’s ever present rain. I’m happy that my fridge isn’t stuffed with excessive amounts of wilting kale. You can read about “the pantry principal,” (which I stole from Amy Dacyczyn) in this nine-year-old blog post. I sold the top half of a Fiestaware butter dish, I put together a couple new eBay listings, I picked up a library copy of Hooked: How to Build Habit-Forming Products by Nir Eyal, I invited my mother and step father over for a frugal yet delicious dinner, (hosting doesn’t have to be expensive) and I worked two 12-hour hospital shifts.